From citizenship and migration to nationhood, art and geography, Nowhereisland, is already inspiring schools to sign up and get involved. Schools can get involved in the lead up to the journey in summer 2012 and beyond. To help teachers plan sessions, we have produced Explorer Packs and other resources to download to kick start discussion and to run related activities. Become a Nowherian: we can sign up whole classes as citizens of the new nation and send you all certificates. We don't need individual email addresses, just names. See Explorer Pack 2 below for details of how to make the most of this opportunity. Help write the constitution: a great way for students to explore citizenship. See Explorer Pack 2 below for details of how to make the most of this opportunity. Run a Nowhereisland project: Using the Explorer Packs for ideas and suggested methods, you can plan a whole project to fit in with your and students needs and interests. The wonderful Magic Hour film club at High View Primary School in Efford, Plymouth have made an animation about Nowhereisland. It’s a great way to introduce the project in assembly or the classroom, especially for KS1 and KS2. You can view it on the website or download it to your computer. Thanks to Efford Take A Part who funded the film, film-maker Hana Bcckland, teaching assistant Gemma Ward and all the children who made it. If you would like to view this film in school, you may find it easier to download it to a laptop or memory device outside of school (where there are no download or viewing restrictions). The video file is held on Vimeo. If you are not already a member of Vimeo, you will need to join (it takes less than a minute). The download button is on the right hand column towards the bottom of the page. It will take 5-10 minutes to download. There are three of these to download. Each relates to an issue as explored elsewhere in The Embassy section of this website and includes an introduction, discussion points and suggested activities. You can use just one part of a single Pack, or combine related elements from all three. We've selected images that can be edited and used to introduce Nowhereisland and the themes in the Explorer Packs. Teachers can also download an information sheet with details of the slides we have selected. Nowhereisland powerpoint information (Word Doc. available soon). This is a great way to introduce the film to KS3 and KS4 students. It has footage from the 2011 Arctic expedition and you'll hear from Alex Hartley and Claire Doherty, Director of Situations, who are the producers of Nowhereisland. If you would like to view this video in school you may find it easier to download it to a laptop or memory device outside of school (where there are no download or viewing restrictions). The video is held here on the Vimeo website. You will need to join Vimeo if you are not already a member (it takes less then a minute). The download instructions are in the right hand column towards the bottom of the page. This was made by some of the expedition team on the 2011 Arctic journey and is performed here by Kieron Kirkland and filmed by David Bickerstaff. Through storytelling it captures many of the issues at the heart of this project and its origins. This film is the focus for Explorer Pack 1, but can be be used as part of any introduction to Nowhereisland. If you would like to view this video in school you may find it easier to download it to a laptop or memory device outside of school (where there are no download or viewing restrictions). The video is held here, on the Vimeo website. You will need to join Vimeo if you are not already a member (it takes less then a minute). The download instructions are in the right hand column towards the bottom of the page. 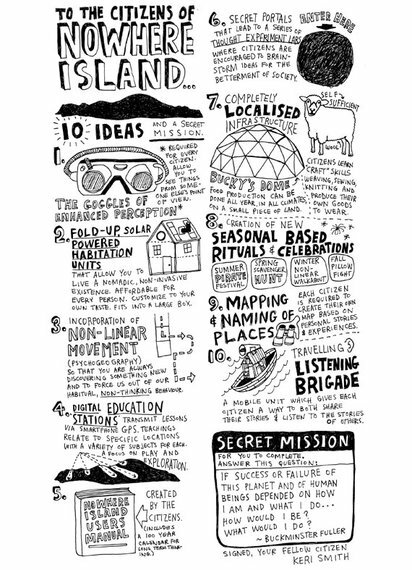 Best selling author Keri Smith produced this as her Resident Thinker contribution and it provides another way of introducing Nowhereisland and suggestions for activities. We are really grateful to the Royal Norwegian Embassy who provided special funding to make these resources available to schools. For more details on Svalbard which is in the Kingdom of Norway and the origins of Nowhereisland, see here.